One in five residents of the Inland Empire is an immigrant. But until now, no single resource has provided a comprehensive view of the region’s immigrant population and the key policy issues that have affected and continue to impact it. That all changes with the publication of “State of Immigrants in the Inland Empire,” a report released Wednesday afternoon during a launch event at the University of California, Riverside. 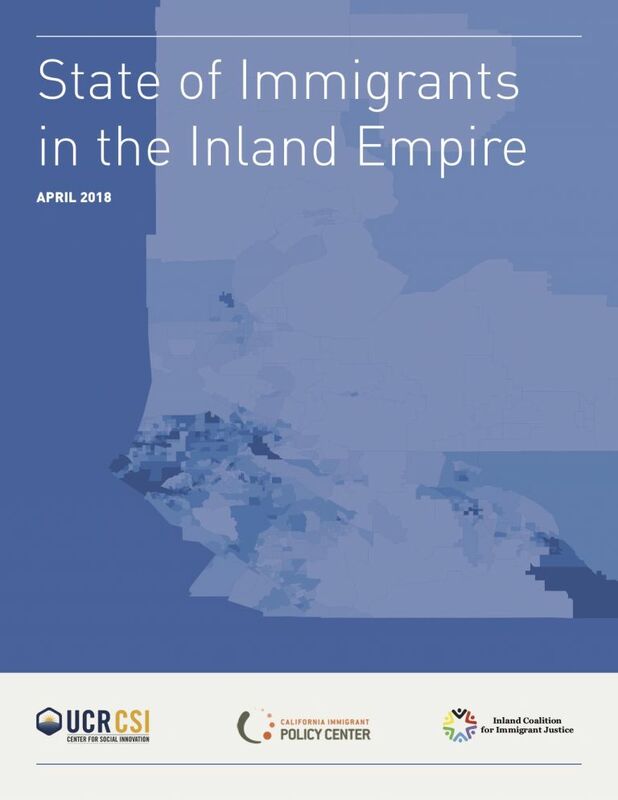 Co-authored by researchers and advocates from UCR’s Center for Social Innovation, the California Immigrant Policy Center, and the Inland Coalition for Immigrant Justice, the report offers a multifaceted look at the nearly 1 million immigrants living in Riverside and San Bernardino counties. While introducing the project, Center for Social Innovation Director Karthick Ramakrishnan described it as the result of collaborative partnerships formed with private and public stakeholders to address policy issues tied to immigration. “We want this to be a resource for the community,” Ramakrishnan said, noting researchers will continue to add new data and other materials to the report’s digital edition. So far, the first iteration of the project features a range of U.S. Census Bureau statistics about the Inland Empire’s more than 972,000 immigrants, a slight majority of whom live in Riverside County. According to Ramakrishnan, some of the statistics included might surprise readers. Forty-eight percent of the region’s immigrants are naturalized U.S. citizens, and 52 percent are not. Latinos represent a greater share of immigrants in the Inland Empire than in the rest of Southern California; 49 percent of the region’s total population — and 69 percent of its foreign-born population — is Latino, although most of the region’s Latinos are native-born. At 33 percent, Filipinos account for a larger portion of the Asian immigrant population in the Inland Empire than in Los Angeles County, where they account for 24 percent. The opposite is true for Chinese Americans, who are 33 percent of the Asian immigrant population in Los Angeles County and 22 percent in the Inland Empire. When compared with the average for Southern California, immigrants in Riverside County are more likely to work in construction and agriculture, while immigrants in San Bernardino County are more likely to work in transportation. Beyond the numbers, the report grounds the region’s immigration narrative in history, covering the arrivals of various ethnic groups to the Inland Empire throughout the 19th and 20th centuries. The goal, Ramakrishnan said, is not to isolate immigrants but to see where their stories fit in with those of other racialized groups that have lived in the region. The report then juxtaposes those histories with information about policies that have shaped the region’s immigration landscape over time, as well as contemporary policy issues that remain on the table. According to its co-authors, some of the region’s highest priorities should include expanding access to language, health insurance, and higher education for immigrant populations. “Change doesn’t happen overnight; change is a long process, and what we’re seeing in the Inland Empire is the beginning of that change,” said Javier Hernandez, director of the more than 30-member Inland Coalition for Immigrant Justice. Hernandez explained that immigrant voters aren’t a single-issue community, a sentiment that’s brought to life by the report’s profiles of immigrants who live and work in the Inland Empire today. When asked to name the issues they consider most important, interviewees touched on a host of concerns related to job growth, fair wages, affordable housing, and environmental health. “We need to empower local communities so that the state is powerful,” said Cynthia Buiza, executive director of the California Immigrant Policy Center. Buiza also spoke of the need to eliminate disparities that exist between gateway cities, such as Los Angeles and San Francisco, and the state’s inland regions, where many immigrants end up settling. One solution she identified involves opening an immigrant affairs office in the Inland Empire. More about the Center for Social Innovation: Housed within UCR’s School of Public Policy, the Center for Social Innovation aims to provide a credible research voice that spurs civic leadership and policy innovation. The center will be a breeding ground for collaborative projects that boost collective impact — all with the primary goal of shifting away from a “problem” narrative to an “opportunity” narrative for marginalized communities and localities. The center’s initial efforts are funded by the James Irvine Foundation and the Weingart Foundation. Funding from the Wallace H. Coulter Foundation also supports the center’s research and national outreach involving Asian Americans and Pacific Islanders.